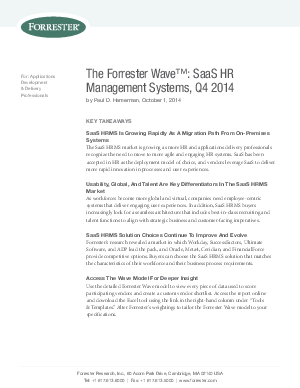 In Forrester’s 60 criteria evaluation of SaaS HR management systems (HRMS) vendors, we identified the eight most significant software providers serving medium to large companies — ADP, Ceridian, FinancialForce.com, Meta4, Oracle, SAP SuccessFactors, Ultimate Software, and Workday — in the category and researched, analyzed, and scored them. This report details our findings about how well each vendor fulfills our criteria and where they stand in relation to each other to help application development and delivery (AD&D) professionals and their HR business partners select the right SaaS vendor for their human resources management needs. Download now to help select the right SaaS vendor for your HR management needs.